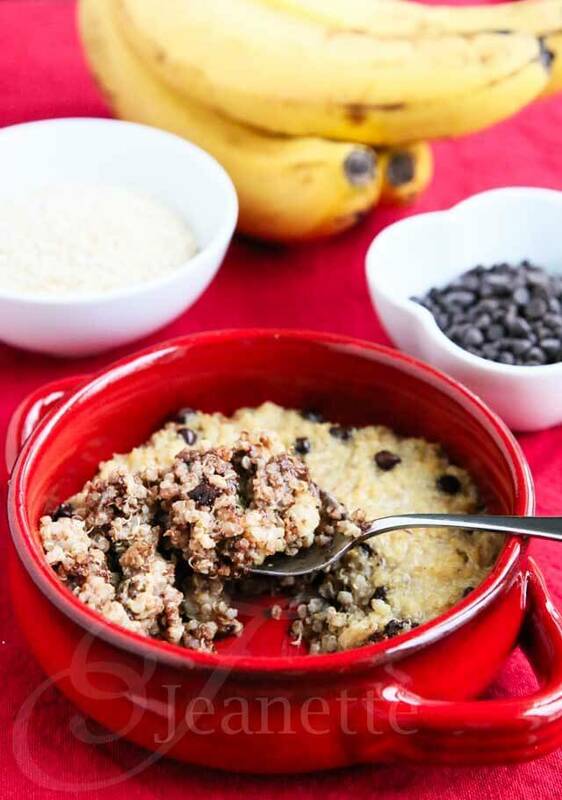 This Quinoa Banana Chocolate Chip Breakfast Bake is a great way to start the day off – kind of like banana chocolate chip bread in a bowl. Recently, I picked up a copy of The Daniel Plan 40 Days to a Healthier Life by Rick Warren, which encourages living a healthy lifestyle by focusing on five areas: faith, food, fitness, focus and friends. The basis for this plan is that God designed our bodies to be healthy, and in order for us to engage fully in the purpose for our life, to love, serve, connect and celebrate the gifts God has given us, we need to treat our bodies and minds with the care that He intended. Faith and friends are the “secret sauce’ that make The Daniel Plan so effective. Pastor Rick Warren and thousands of people from the Saddleback Church transformed their lives through the Daniel Plan – 15,000 people lost over 260,000 pounds in the first year! That’s an incredible measure of success. I’m still working my way through this book, but in the meanwhile, I wanted to share a recipe inspired by the Quinoa Breakfast Bake recipe in the back of the book. 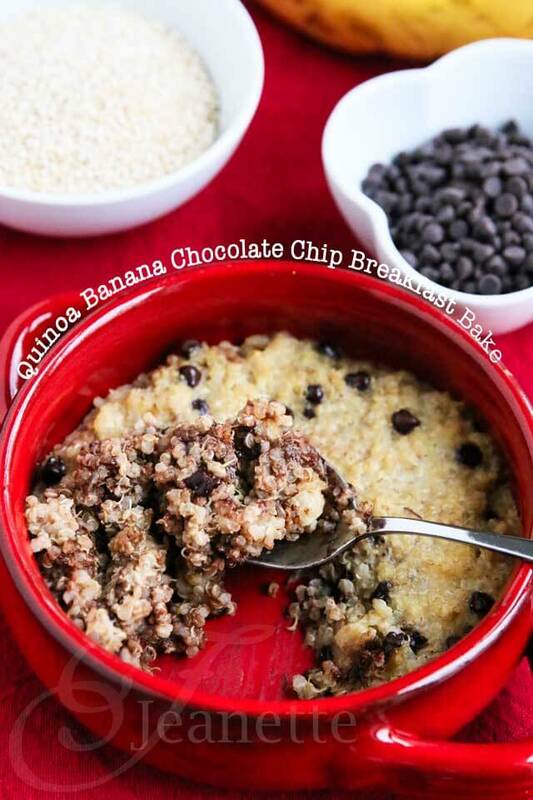 Think of this Quinoa Banana Chocolate Chip Breakfast Bake as a healthier version of banana chocolate chip bread. Even my kids who are not big fans of quinoa loved this. Bring water to boil; add quinoa and salt. Bring to a boil, then reduce heat to low and simmer, covered, for 20 minutes until water is absorbed and quinoa is cooked. 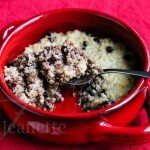 Remove lid and spoon quinoa into a large mixing bowl. Let cool. In a medium bowl, whisk together eggs, almond milk, vanilla, cinnamon and maple syrup. Add to quinoa and mix well. Gently stir in mashed bananas and chocolate chips. Spoon into individual baking dishes or one large baking dish. Bake for 20-25 minutes until breakfast bake is set. This looks soooo good, Jeanette! The Daniel Plan rocks. Thanks for sharing. 🙂 Pinning! This looks amazing! Just pinned! 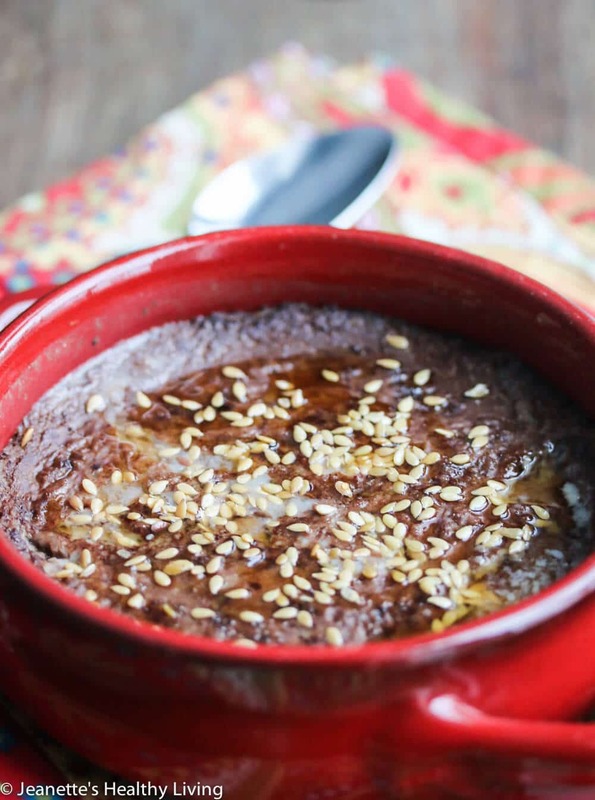 I make a pumpkin spice quinoa bake and this is a fantastic alternative! Can’t wait to try it! 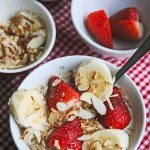 Kris, I just added some estimated nutrition information in the blog post. I made this in separate serving dishes for portion control, and I found one serving to be a pretty good size portion. It’s very filling, so you could probably even separate this recipe into 8 portions if you’re trying to count calories. If you use stevia, the calories would drop to 360, and the sugar would drop to 15g assuming 6 portions. Hope that helps. Hi! WhY the stevia? How do I reduce the calories please? Gidget – leaving out the maple syrup will save about 50 calories per serving (360 calories). I only suggest stevia because it is zero calories an some people like it. I personally don’t use it. Each serving is about 1 cup of quinoa. So, if you’re looking to reduce calories, you can cut the serving size in half. The recipe per serving is 1 cup cooked quinoa, 1 egg, 1 tablespoon almond milk, 1/4 t. vanilla, dash of cinnamon, 1/2 banana, 1 tablespoon mini chocolate chips. So, you can measure out one serving and split it in half (save one for another day). I like to make a batch and keep extras in my refrigerator. 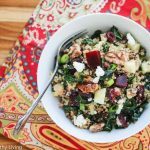 Cooked quinoa is great in soups, salads, stir-fries, and this Quinoa Banana Chocolate Chip Breakfast Bake. I give you a lot of credit being a single man again trying to cook healthy. Best of luck! 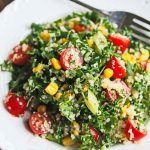 Does anyone have the Nutrition breakdown of this recipe? Calories,Fat, etc? Kim, I’ve added estimated nutritional info. for this recipe in the blog post. This recipe assumes 6 good size portions (I used individual baking dishes). You can divide this into more portions if you’re targeting lower calories/fat. Hope that helps. Is there an alternate for the Almond milk? Maybe soy? My son has an almond allergy but I know h would love this. Deanna – you can use any milk that your son can have – soy, coconut, rice, hemp. I hope your son enjoys this. I recently heard of The Daniel Plan and thought it sounded so interesting – it sounds like it is hugely successful! 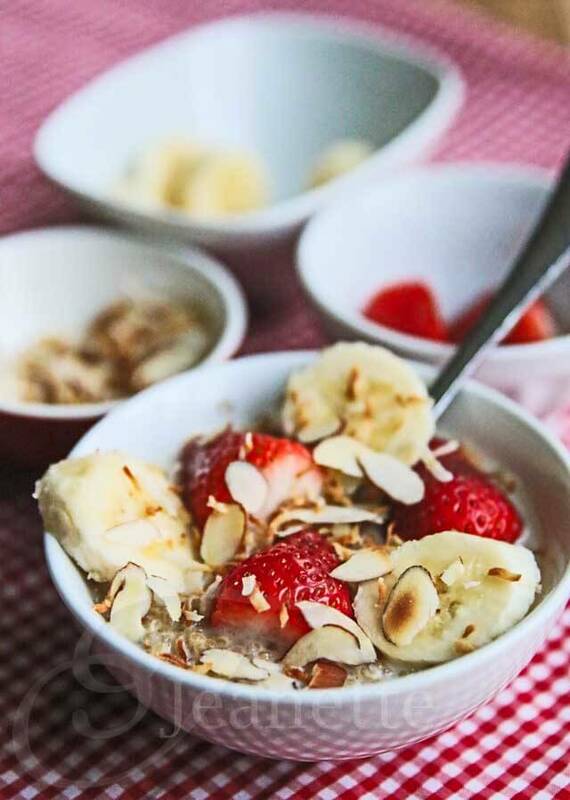 This looks like the perfect hearty and delicious breakfast to wake up to on a chilly morning! Does it re-heat well? I’m just curious because this looks amazing to have a few mornings without having to make it new each time. Kane – I haven’t tried reheating this, but I would guess if you topped it off with a little liquid (milk of your choice), it should reheat fine. I actually make a batch of quinoa at the beginning of the week, and use leftovers to make this breakfast bake. Is it me? I am looking at the picture and the title of the recipe, Quinoa Banana Chocolate Chip Breakfast Bake. But there are no bananas and no chocolate chips in the recipe printed here. So again, is it me? Joyce – it’s fixed – I had a technical glitch. Thanks! Can you tell me what the purpose of the eggs are in this recipe? Unless I am making eggs because I want eggs, I tend to replace eggs with ground flax seed (1 Tbls flax seed dissolved in 3 Tbls water is equal to 1 egg when baking and such). I’d like to replace the eggs in this with flax, but don’t want to just assume they aren’t necessary. Thanks! Erin – the eggs really just serve as a binder and source of protein, so you should be able to substitute flax seed gel for it. That’s what I assumed (but you know what they say about assuming 😉 Giving this a try this week, thanks again! Seriously delicious, Jeanette. Makes me wish I could eat quinoa! I love this! 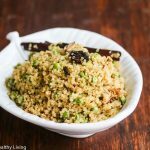 I haven’t use quinoa in breakfast dishes but am trying this soon! Can’t wait to try it! Looks very delicious. Can this be frozen? If so, how do I reheat. If not, how can I just make one serving. I am only one person so I don’t want to make so many servings. But looks yummy! Lauren – I haven’t tried freezing this, but if you bake it and then freeze, that might work. I wouldn’t freeze it unbaked as I have a feeling the bananas might turn color. Alternatively, I would make a smaller batch of quinoa (e.g., 1/2 cup plus 1 cup of water) and scoop out 1 cup cooked quinoa to make one serving of this breakfast bake. See my comment above with the amount of ingredients adjusted for one cup of quinoa. 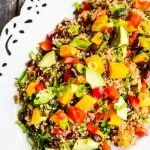 You can always use the extra cooked quinoa stirred into soup, tossed into a salad or stir-fried with chicken and veggies. This looks delicious! Never tried quinoa for breakfast, I think I might try this though. Thanks for sharing! Thanks Danielle! I’ve been trying to add quinoa to my breakfast in different ways. 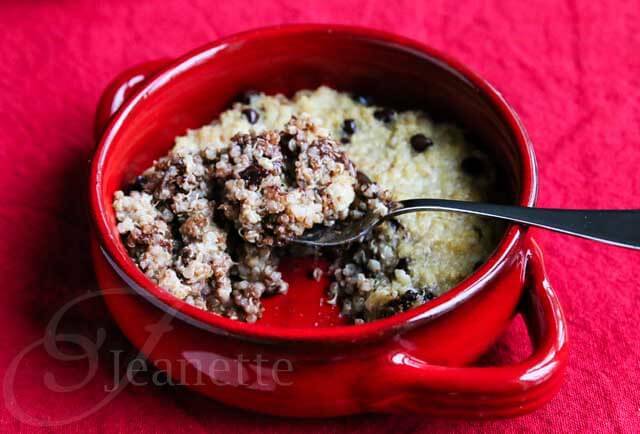 Never have had quinoa for breakfast before, but with the addition of bananas and chocolate chips it’s a no-brainer. Looks amazing! 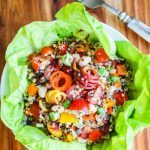 Thanks Cheri – I’ve been trying to eat more quinoa for breakfast – this is a fun one! Thank you Rachel! I appreciate your thoughtful comment. Looking forward to your haitian recipes! Would it be possible to substitute the banana for something else? Or will it bake well without the banana? Katie – banana adds some texture and sweetness – applesauce or some other pureed/mashed fruit would probably work just as well. Can I make this ahead of time then bake? Like the night before and bake in the am? Kristin, I haven’t tried doing that but I don’t see why not. Just cover it well. Would love to hear how it turns out if you assemble it ahead of time. I assembled the dish the night before and it turned out great! My guests raved about it and wanted the recipe. The dish turned out great assembling ahead of time! My guests loved it and wanted the recipe. 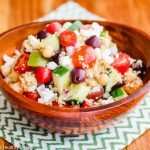 Kristin – thanks so much for letting me know that this worked great assembling it ahead of time – very helpful for all that want to try this recipe. This is kind of a stupid question, but is it 1 1/2 cups of uncooked quinoa? Because it does get bigger after it’s cooked so that changes things a bit. 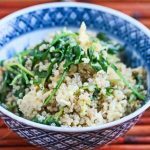 Hi Chanel – the quinoa is uncooked – just be sure to rinse it well as most quinoa has a bitter coating that needs to be washed off before cooking. I looooovvvvveeeee this recipe!!!! 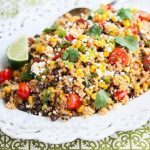 I was wondering if anyone has tried to make this in a crock pot? 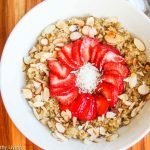 I used to make just savory quinoa, but I am always trying to incorporate healthier grains into breakfast too. Glad you like this recipe! Holly, So glad you tried and liked this recipe! I think it should keep up to a week in the fridge. I made it in individual size baking dishes, but I”m guessing it would fit in a pie dish or an 8″x8″ dish. Could substitute honey for the maple syrup? I’m wondering if that would work as well? Honey should work fine Toni – let me know how it turns out. WIll do. Just cooked up the quinoa now…hopefully will enjoy this dish for bfast tomorrow. OMG! It came out delicious! I subbed reg milk for the almond, as I didn’t have almond, and the honey for the maple syrup. Tasty! It’s super warm and fluffy. I was looking for warm and sweet in the morning, and I’ve found it! Thanks so much! Toni, so glad this turned out well for you. It’s great for a warm breakfast. Hello! Can I use agave nectar instead of maple syrup? I have had this pinned for a while and am now finally getting ready to make it but I don’t see the actual recipe here anymore? This is a favorite of mine! However I am not seeing the recipe any longer. Any way we can access it again? Hi Charlotte – I just added the recipe back. Enjoy! Thank you so much! Baking this right now!